Enjoy a day of mindfulness and peace! On many Sundays, Deer Park welcomes visitors to practice with us for a Day of Mindfulness. Please check our Calendar to confirm that the monastery will host a Day of Mindfulness on the date you wish to visit. Once the date is confirmed, you just show up. We do not take reservations for Days of Mindfulness. If you are planning to come for the first time, we would like to ask you to read this introduction to the practice of mindfulness here at Deer Park. You can also listen to a 30 minute introduction to the practice of mindfulness on our Deer Park Dharma Cast. Please note: the monastery gate will be open from 8 AM to 5 PM on Days of Mindfulness and will be closed to visitors outside of these times. Below you can find a sample schedule for the day with more information about the day and how to enjoy your day at the monastery. Please park in the main parking lot and make your way to the Solidity Hamlet campground. If you arrive early, feel free to enjoy a cup of tea in the dining hall, the building one level up from the meditation hall. 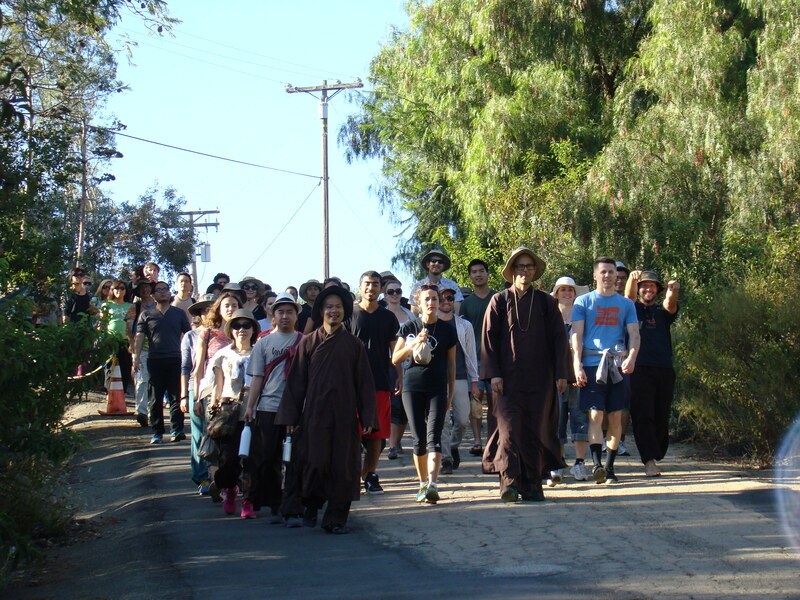 Walking meditation is a practice of walking together and being present with each step. We walk with freedom and solidity, no longer in a hurry, allowing our body and mind to be calm. A Dharma Talk is a teaching about meditation and well-being. On the first Sunday of each month, we usually include a Recitation of the Mindfulness Trainings and on other Sundays, we usually include Dharma Sharing. Eating a silent meal together can be a meditative practice. We establish ourselves in the present moment and practice eating with a sense of peace, ease, and gratitude. The bookshop carries a variety of books by our Zen master Thich Nhat Hanh in English and Vietnamese, as well as other items that support mindfulness practice. Also known as “Total Relaxation Meditation”, this is a lying down guided meditation in which we relax and send gratitude to all parts of the body. During this hour long session, we generally start with a 20 minute guided sitting meditation, followed by 20 minutes of slow walking meditation inside the meditation hall, and concluding with another 20 minutes of sitting meditation. We do not take registration for Days of Mindfulness, but please contact us in advance if you are planning to come with a group of twenty or more people. There is no fee for taking part in a Day of Mindfulness, but we suggest a donation of $10 to $20 per person. Donations are our main source of support, so every offering is greatly appreciated. Your contribution can help us to keep the monastery open throughout the year. You can make your offering in any of the donation boxes in the Ocean of Peace Meditation Hall or the dining halls. During most months, there is a children’s program for children ages six to twelve. Please check our Children’s Program page to see the program dates scheduled. A short Dharma Talk may be offered, followed by inspiring games and activities including art, meditation, nature walks, and singing. The program takes place after walking meditation and concludes at lunchtime so that parents may fully benefit from the dharma talk, recitation ceremony, and dharma sharing sessions. Children are invited to join their parents or guardians for walking meditation, mindful lunch, and Deep Relaxation Meditation. Meet at the star sign outside the Ocean of Peace Mediation Hall right after walking meditation. If you can help with the children, please let the program facilitators know. Deer Park is deeply committed to inclusiveness. If you have a particular need for assistance, please contact us so we can offer you as much support as possible. Our meditation hall and dining halls are wheelchair accessible. All meals are vegan. There is generally a variety of options available at mealtime, but feel free to bring supplementary vegetarian food for yourself if you have a particular dietary need. Please wear casual and modest clothing that is comfortable for sitting. Please wear or bring weather-appropriate clothing and shoes suitable for walking on nature trails so you can fully enjoy the outdoor walking meditation with the community. Also, please avoid wearing perfumes or other products that may affect those who are sensitive or allergic to fragrances.